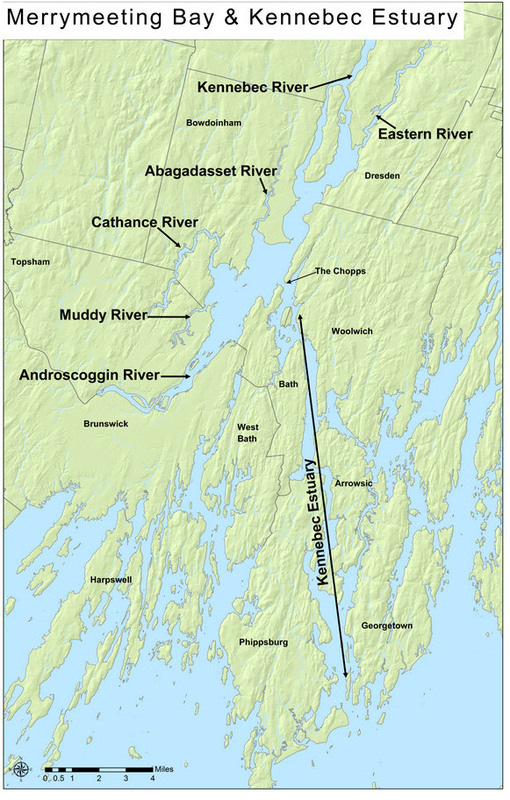 What is the Kennebec Estuary and why is it so important? An estuary is a partially enclosed body of water along the coast where freshwater from rivers and streams meet and mix with salt water from the ocean. Estuaries and the lands surrounding them are places of transition from land to sea. The Kennebec Estuary is comprised of Merrymeeting Bay, the lower Kennebec River and surrounding uplands. In terms of its historic abundance, it is on a scale comparable to the Hudson and Chesapeake Bay estuaries. It is one of the nation’s most significant coastal resources. Twenty percent of Maine’s tidal marshes are found within the estuary, representing the largest concentration of salt marshes in the state. 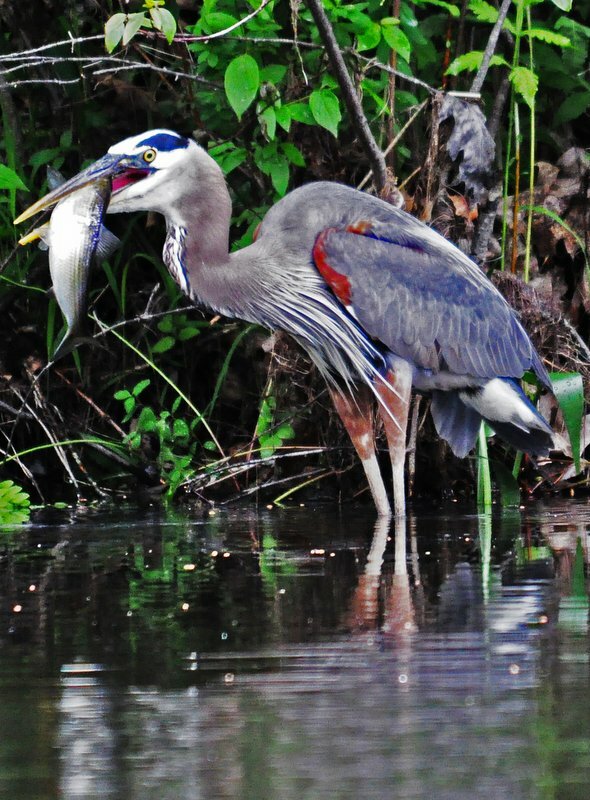 Its coastal wetlands, upstream spawning grounds and forested uplands provide critical habitat for a diversity of wildlife and plant species. Given its relatively undeveloped condition, the Kennebec Estuary offers the opportunity for large scale conservation in fairly intact estuarine ecosystem. Five federally endangered and threatened species inhabit the estuary. What rivers flow into the upper estuary? In the upper portion of the estuary, six rivers converge to form Merrymeeting Bay, an inland body of fresh and brackish tidal waters. Together the Kennebec, Androscoggin, Cathance, Adagadasset, Muddy, and Eastern Rivers drain nearly 40% of Maine, creating shallow, nutrient rich waters with expanses of wild rice. Who lives in the upper estuary? The upper estuary provides 4,500 acres of prime waterfowl habitat. Thousands of ducks, geese, rails, wading birds, and shorebirds depend upon Merrymeeting Bay’s high productivity during the spring and fall migrations and nearly every species seen in the Atlantic Flyway has been found in the estuary. Who lives in the lower estuary? Downstream from the bay, the river runs between forested uplands and rocky shorelines, across mudflats and through salt marshes for another 15 miles. The deep water and strong currents found in the lower river support an abundant food web and habitat for recovering populations of migratory fish, including Atlantic salmon, striped bass, alewife, shad, herring, and sturgeon. All twelve species of migratory fish currently found in Maine live in the Kennebec River, and every native fish species was once found in the river. In addition, the high salt content and significant tidal changes in the lower Kennebec prevent the river from freezing—providing critical habitat for over-wintering bird species. The surrounding uplands contain large areas of undeveloped forests, rare and exemplary natural communities, and significant undisturbed wetland complexes. How does the health of the estuary affect me? The Kennebec River contributes an average of six billion gallons of water to the Gulf of Maine per day. The magnitude of the estuary’s influence on Maine’s coastal waters suggests that the health of the river is of state significance. The estuary’s contribution to the Gulf of Maine fisheries, its rare natural communities, high productivity and diversity, outstanding habitat values, demonstrated resilience, and recreational values make the Kennebec Estuary a rare and nationally significant natural resource.